Sunday Assembly was started by Sanderson Jones and Pippa Evans, two comedians who were on the way to a gig in Bath when they discovered they both wanted to do something that was like church but totally secular and inclusive of all—no matter what they believed. Just by being with us you should be energized, vitalized, restored, repaired, refreshed and recharged. 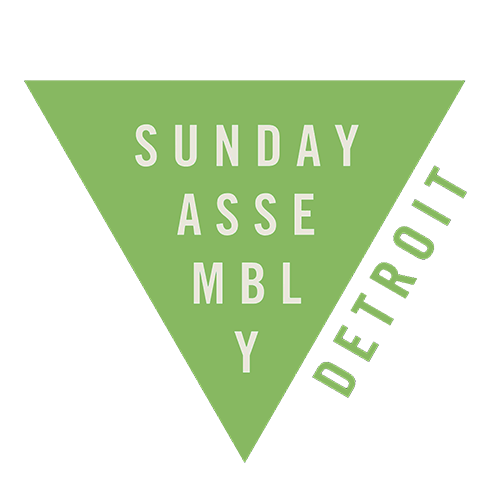 No matter what the subject of the Sunday Assembly Detroit, it will solace worries, provoke kindness and inject a touch of transcendence into the everyday. The Sunday Assembly is a secular congregation that celebrates life. Our motto: Live Better, Help Often, Wonder More. Our mission: to help everyone find and fulfill their full potential. Our vision: a secular congregation in every town, city and village that wants one. Live Better – We aim to provide inspiring, thought-provoking and practical ideas that help people to live the lives they want to lead and be the people they want to be. Help Often – Assemblies are communities of action building lives of purpose, encouraging us all to help anyone who needs it to support each other. Wonder More – Hearing talks, singing as one, listening to readings and even playing games helps us to connect with each other and the awesome world we live in.